"In a land of myth and a time of magic, the destiny of a great kingdom rests on the shoulders of a young man. His name...Merlin." Merlin is a BBC1 series that first aired on September 20th, 2008 and ended December 24th, 2012. It follows Merlin of King Arthur fame in the early stages of his career (except that he's younger than Arthur). The series had a total of five seasons with thirteen episodes per season. The timeslot and intended audience were the same as for Doctor Who and Robin Hood. It was picked up by NBC to air in January 2009. This is the first time in several years that a British TV show has been bought for broadcasting by a major US network. It got a second series, after having done very well against The X Factor and, following a third series, a fourth and fifth were commissioned. 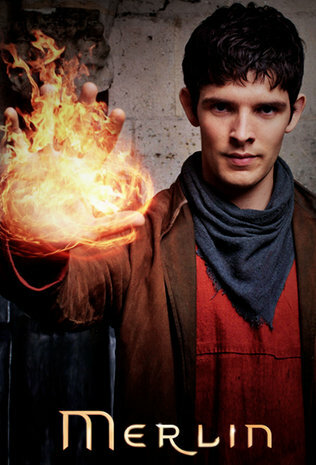 The series focuses on the story and journey of an idealistic, naïve young wizard or warlock, Merlin (Colin Morgan), who goes to live with his mother's old friend Gaius (Richard Wilson), Camelot's greatest physician. Merlin hopes to find a way to use his powers for good, but finds that King Uther (Anthony Head), the ruler of Camelot, has banned magic and executes anyone found practicing it. Merlin saves the life of Uther's heir and only son, Prince Arthur (Bradley James), from an evil witch. He is then rewarded with the position of Arthur's servant. Merlin also encounters the Great Dragon (voiced by John Hurt), who prophesies that Arthur, when he becomes King of Camelot, will someday create the fair and just kingdom of Albion. He tasks Merlin to guide and protect Arthur. Merlin must use his magic to combat magical enemies and protect Camelot while keeping his true nature and identity a secret. Other main characters of the series include Morgana (Katie McGrath) and Guinevere (Angel Coulby). Morgana, Uther's ward, struggles with visions of the future and her emerging magical powers, which gradually turns her against Uther. Guinevere works as Morgana's servant, is close friends with Merlin, and eventually becomes Arthur's main love interest. There is a character sheet and a recap page for the series. Tropes relating to those should go there. Not related to the 1998 miniseries starring Sam Neill, besides having the same source material.